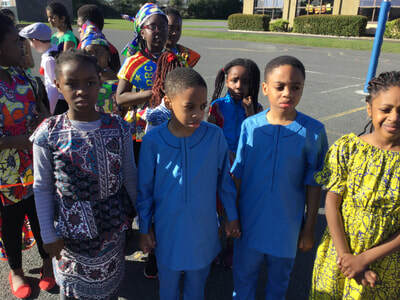 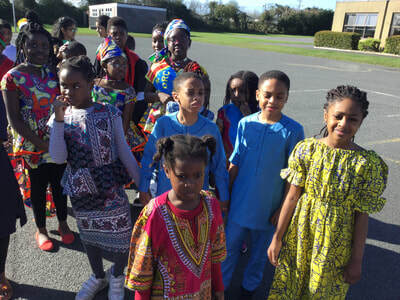 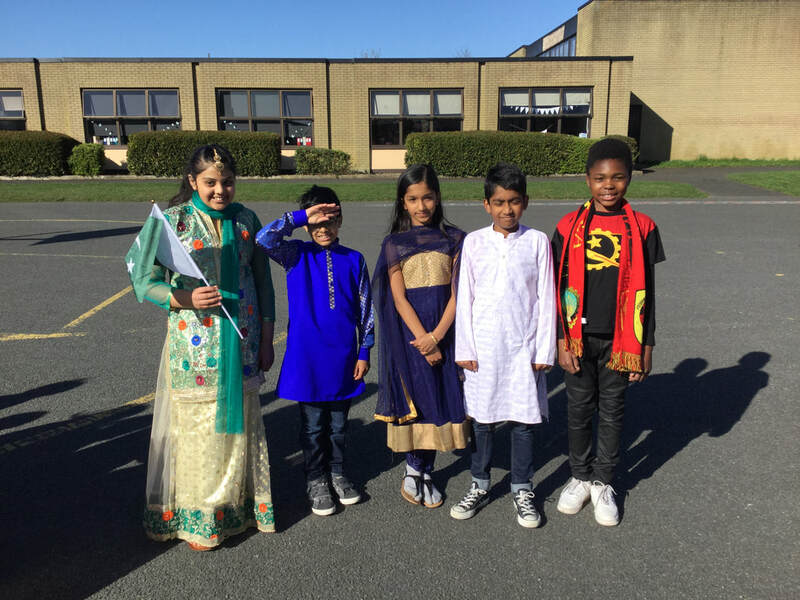 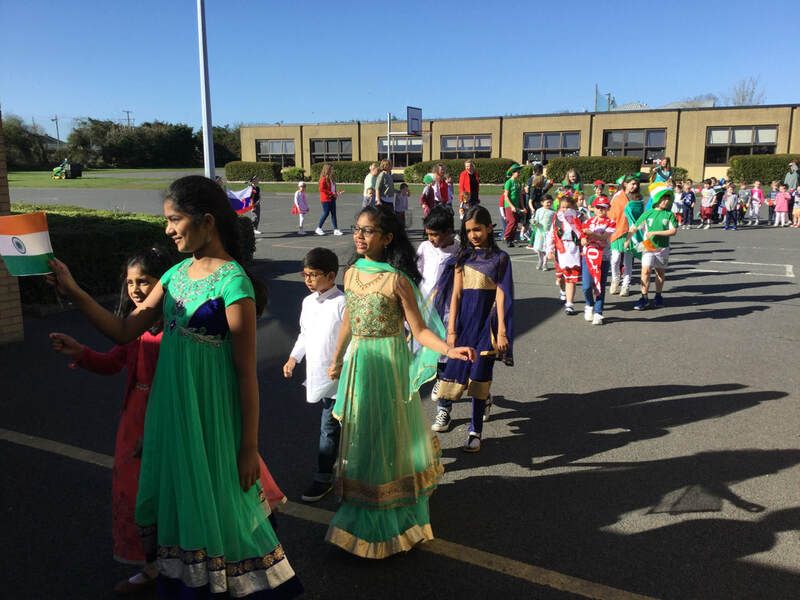 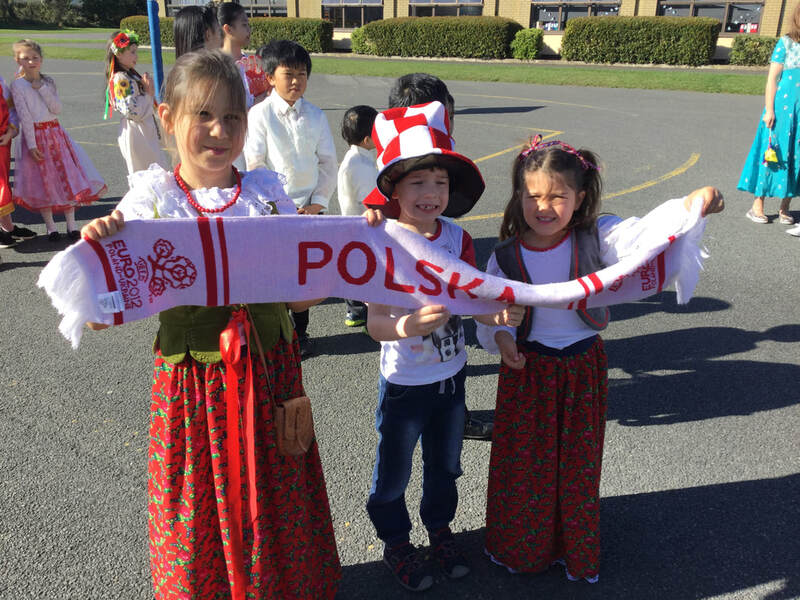 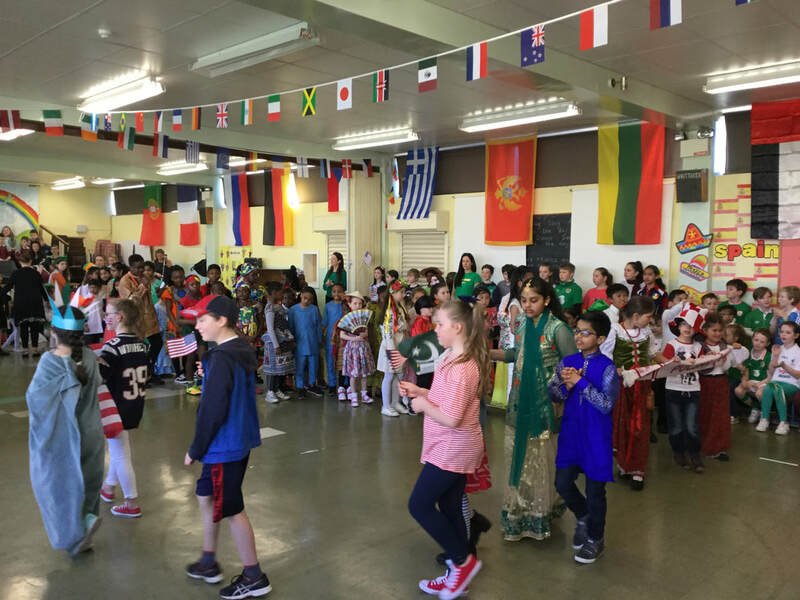 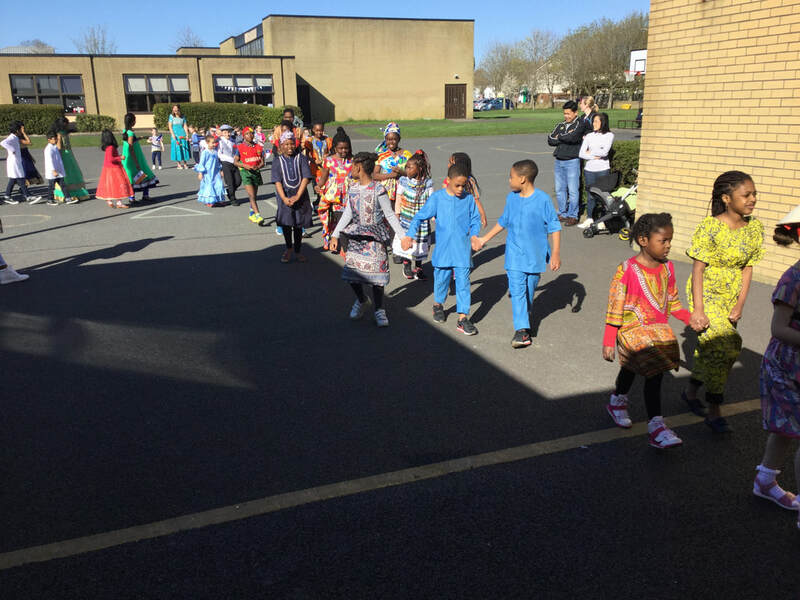 The sun was shining for our third annual Intercultural Day and we had a fantastic day celebrating. 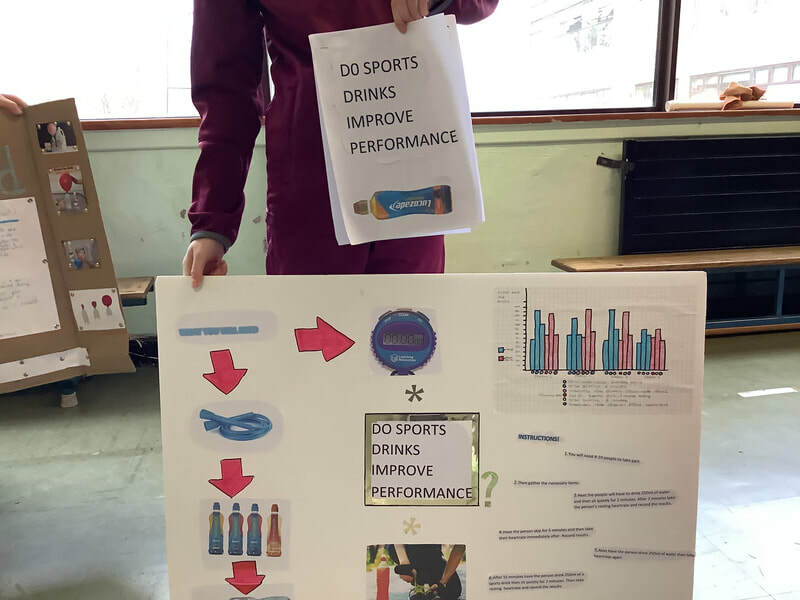 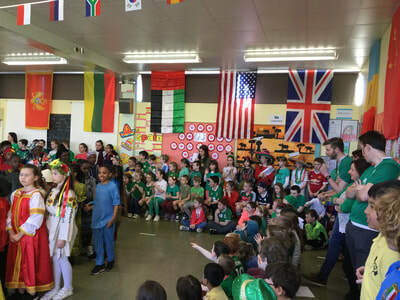 A big thank you to everybody who got involved on the day. 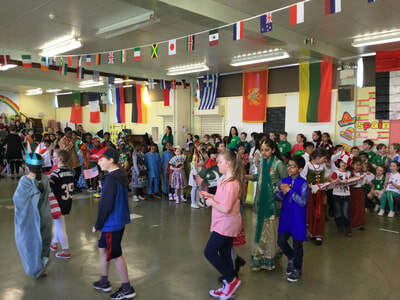 We had so many parents who volunteered their time and talents to help teach our students about their culture. 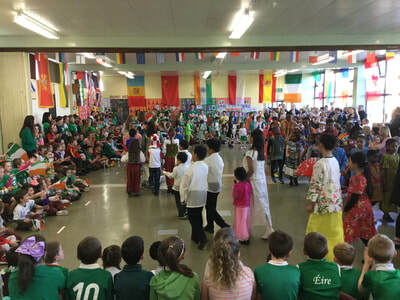 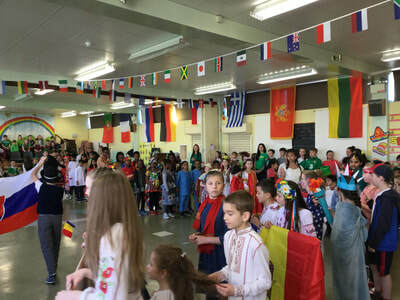 Parents shared photographs, food, music, presentations and national costumes with our students. We started the morning with our Parade of National Costumes. 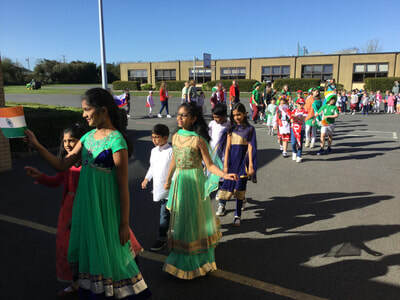 So many people got involved, our parade is getting bigger every year. 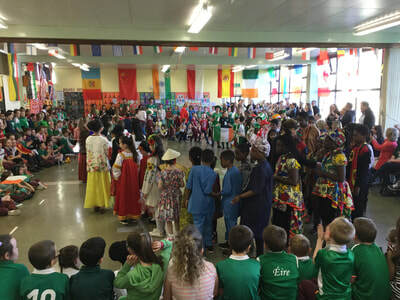 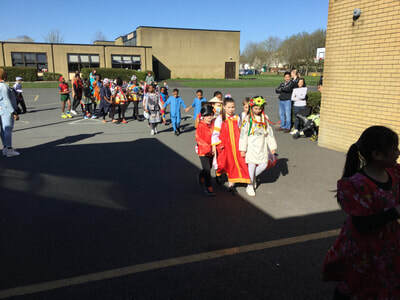 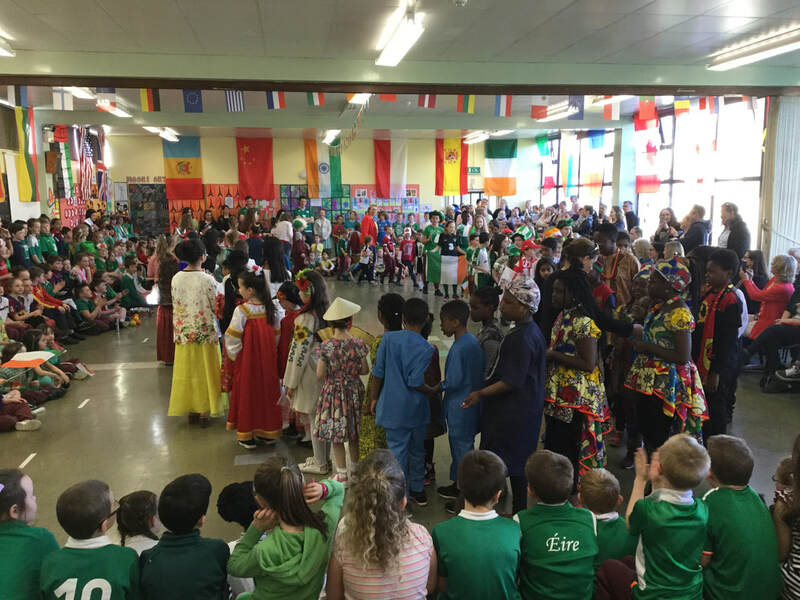 It was wonderful to see all the National costumes from the different cultures in our school. After our parade we started our assembly. 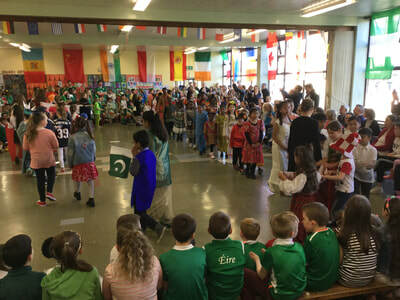 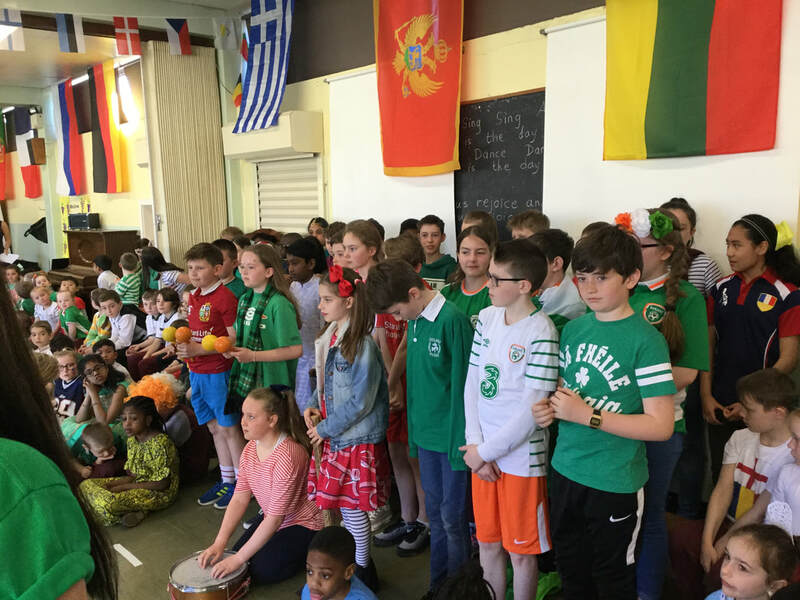 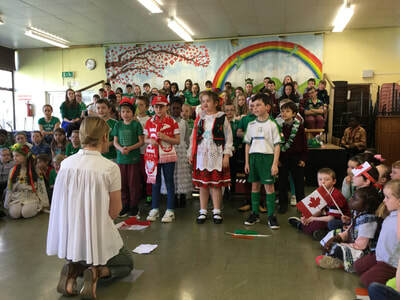 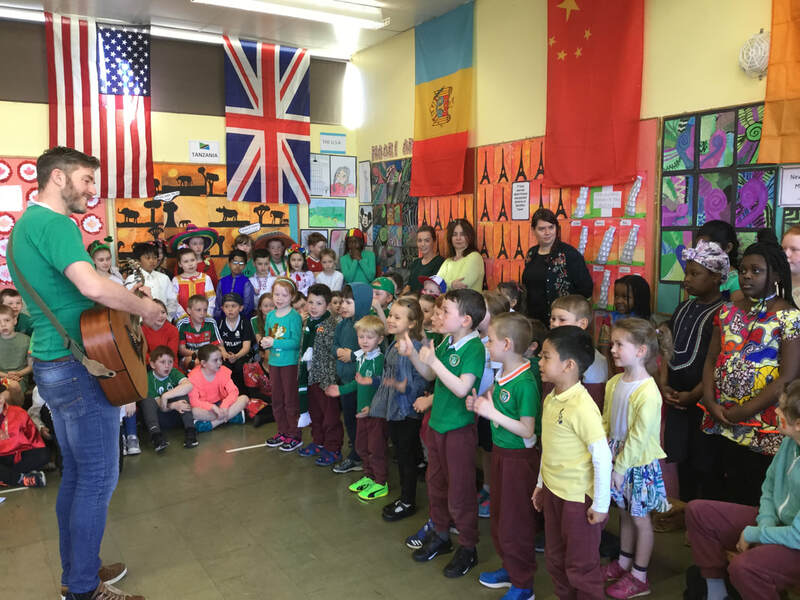 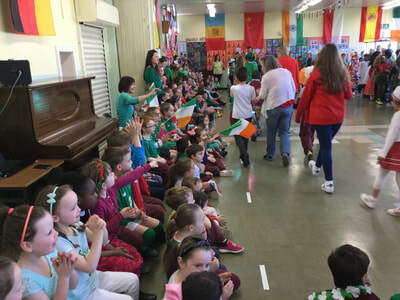 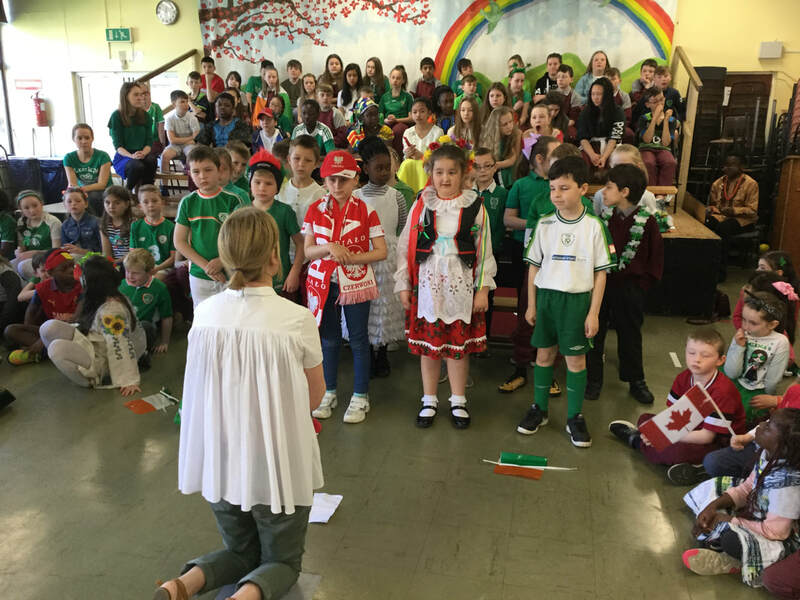 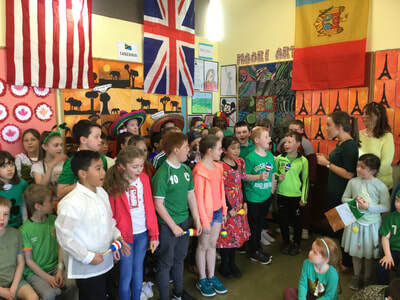 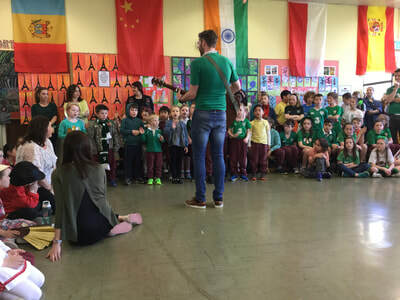 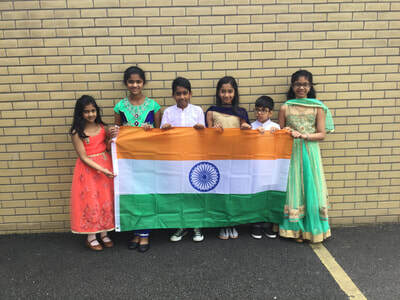 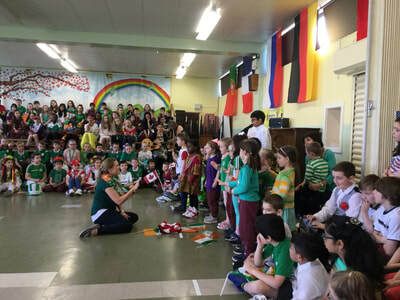 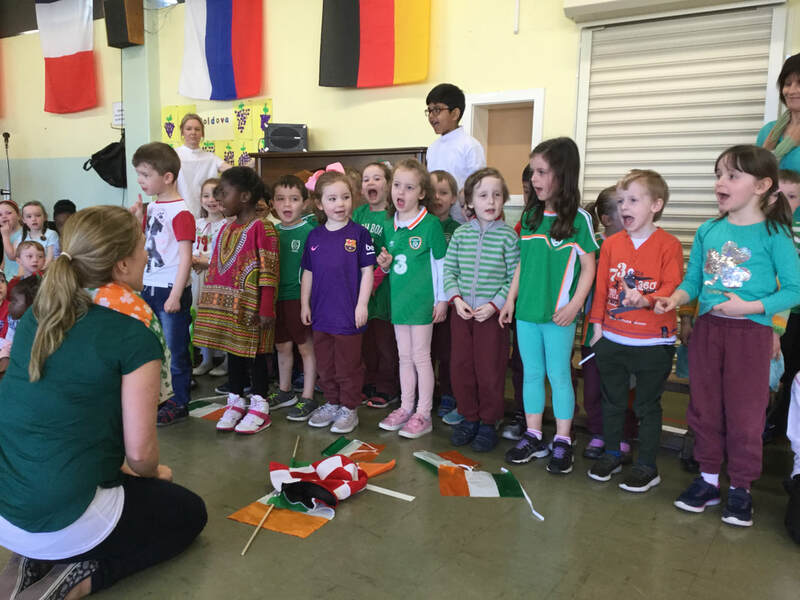 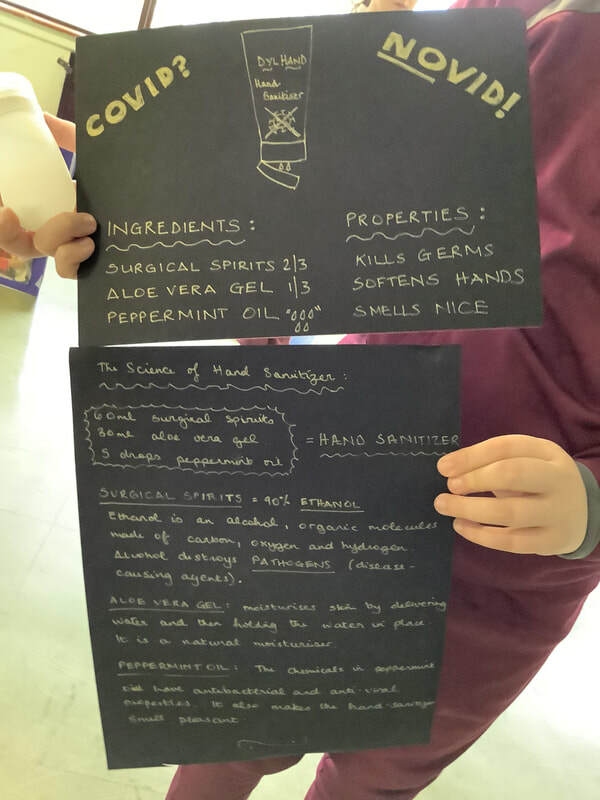 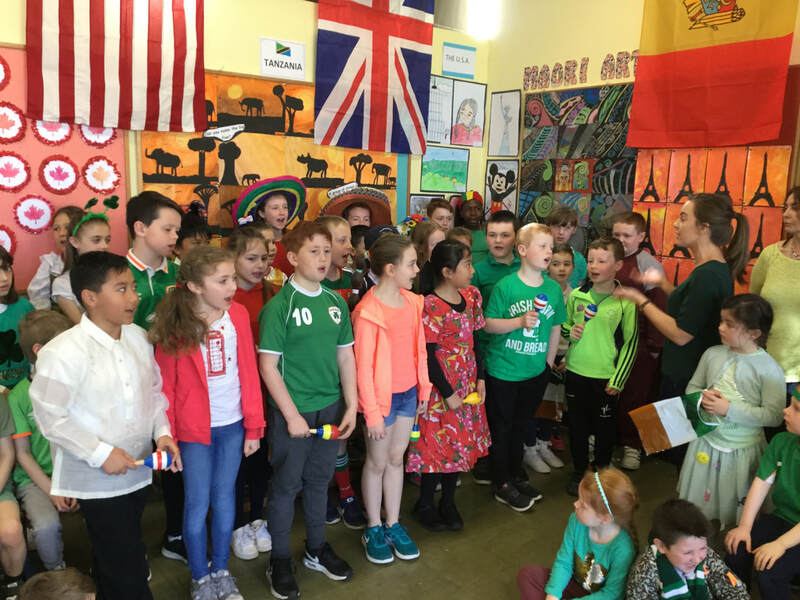 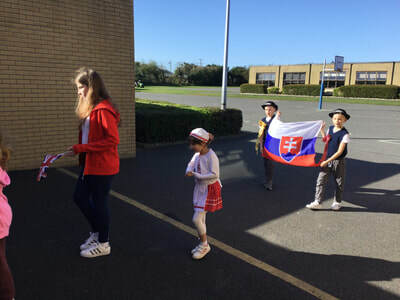 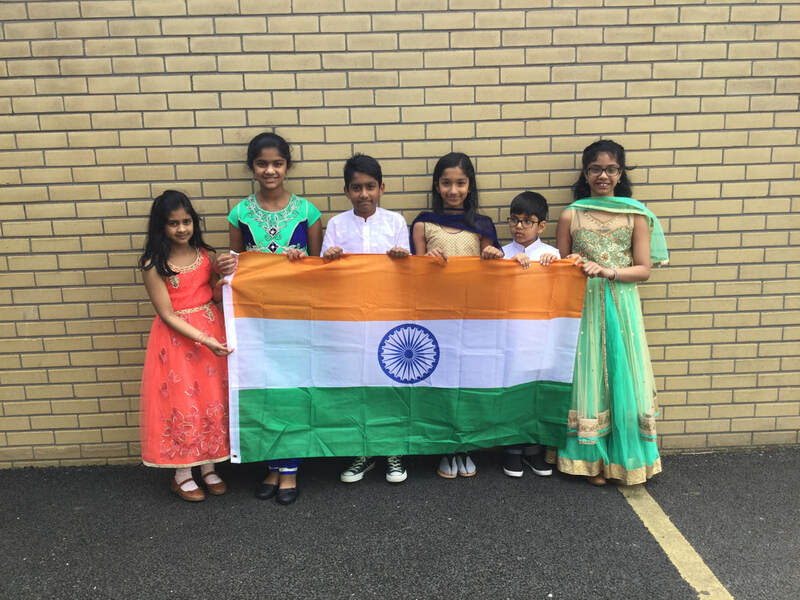 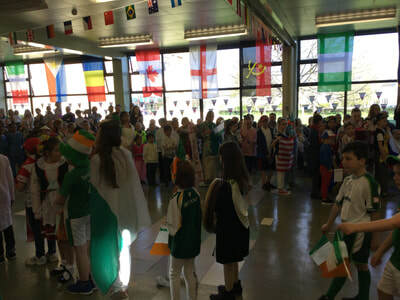 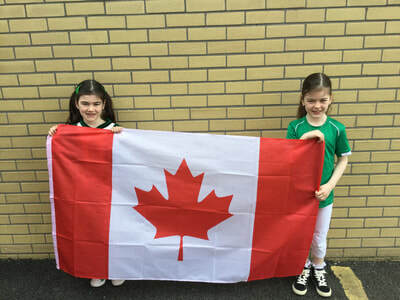 Each class learned about one country, performed a song and completed an art project on their chosen country. 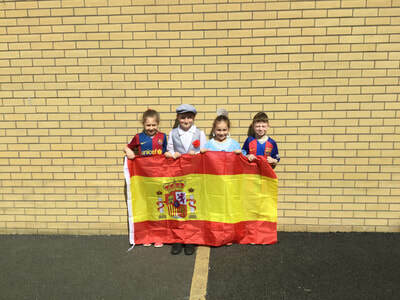 Mr. Lynch's Junior Infants learned about Spain. 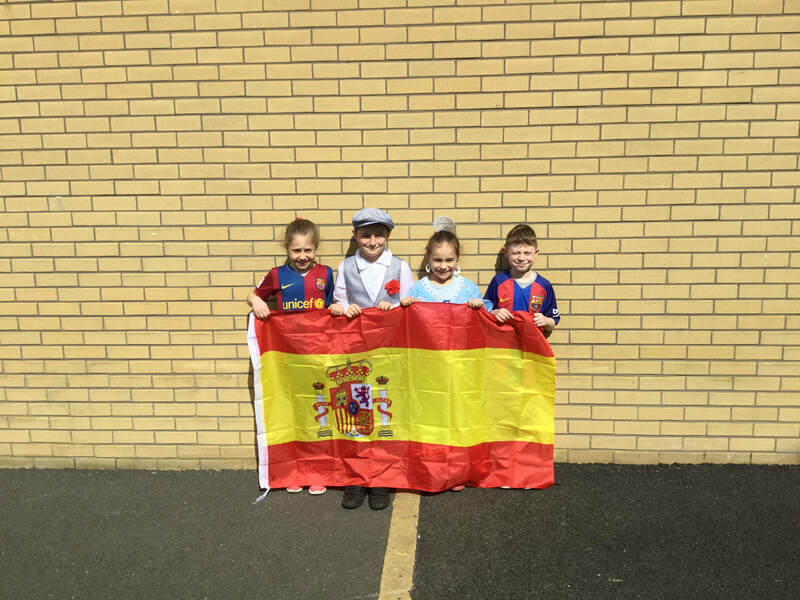 They made the Spanish flag and performed "Hola, Hola", accompanied by Mr. Lynch on guitar. 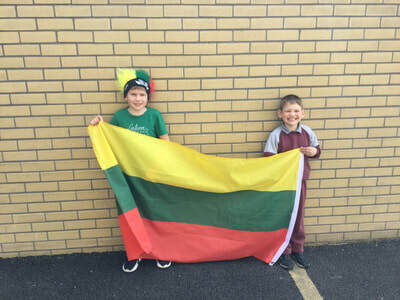 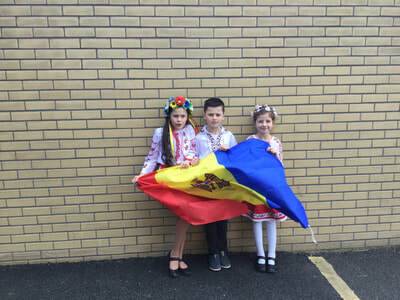 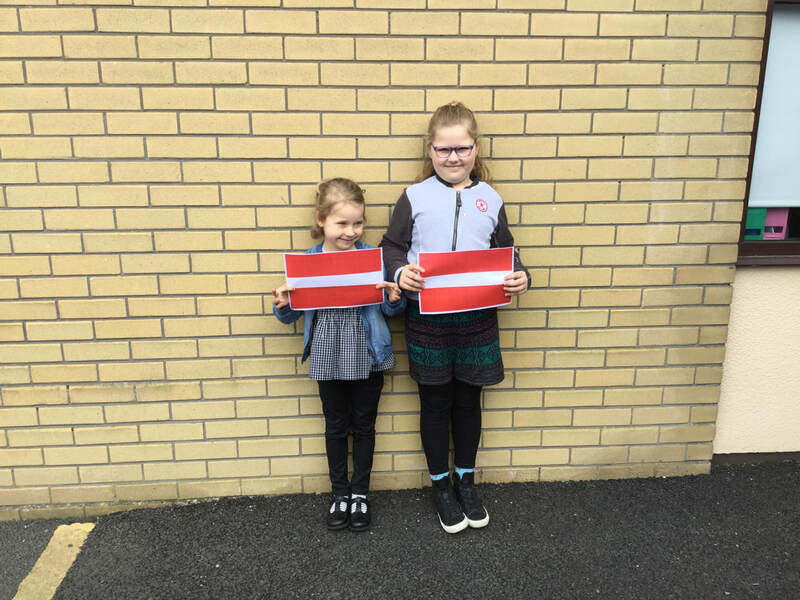 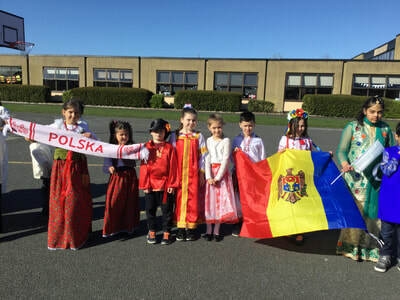 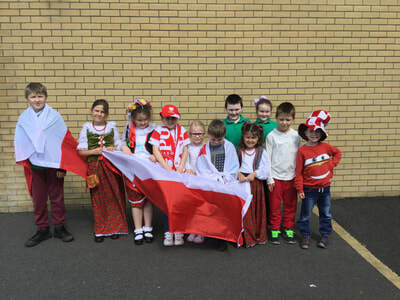 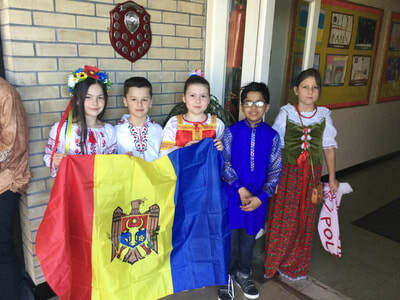 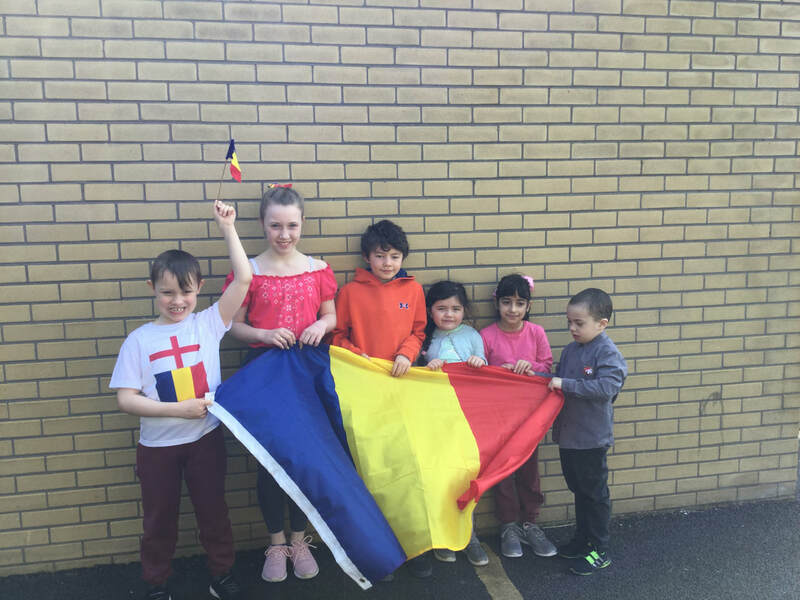 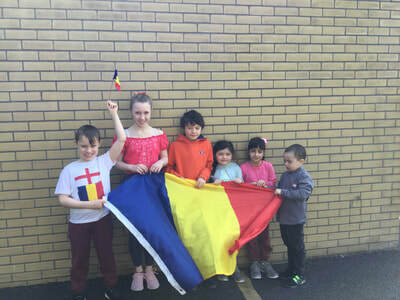 Ms. Lenfestey's Junior Infants learned about Moldova. They painted grapes as Moldova is famous for it's vineyards and they performed a song called "Un elefant se Legăna". Ms. Doyle's First Class learned about France. 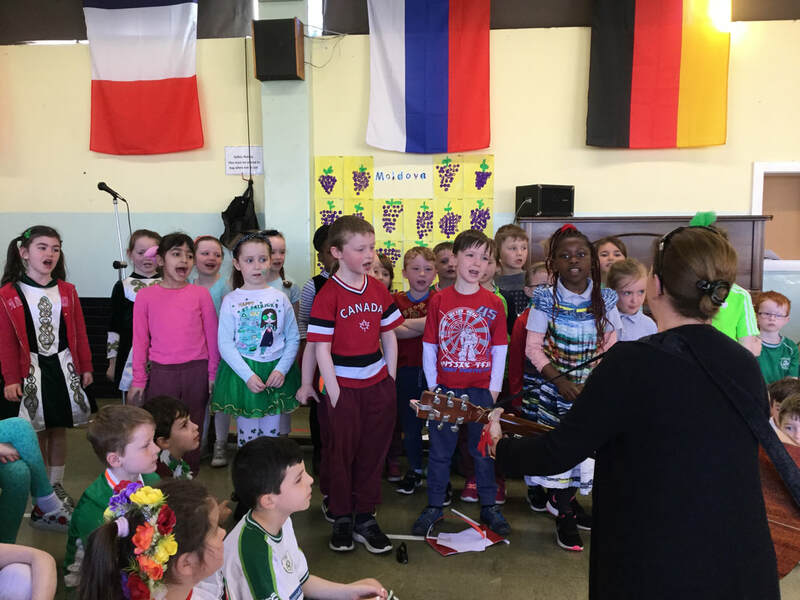 They sang "Frère Jacques" in a round with the help of Ms. McCarthy on guitar. 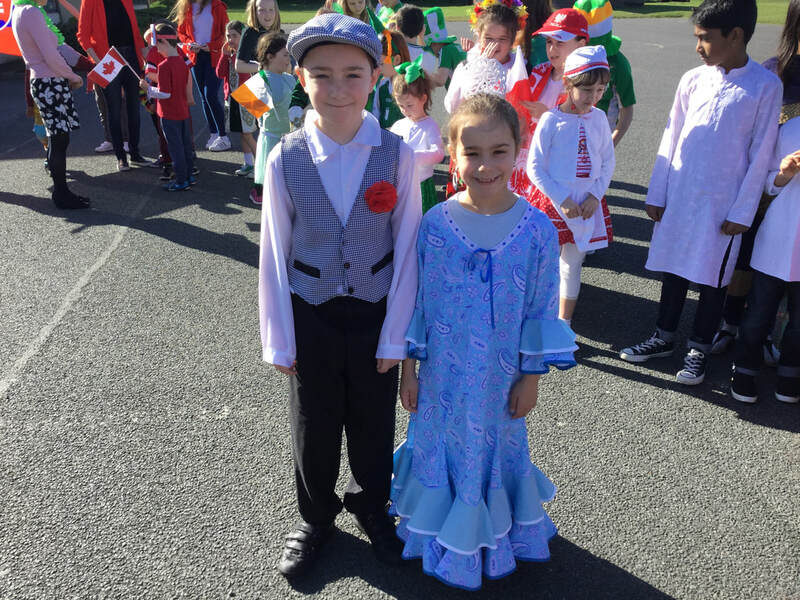 They painted Eiffel Towers, the famous French landmark as their art project. 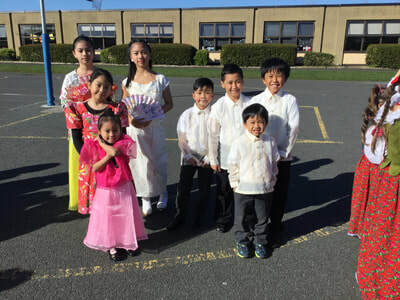 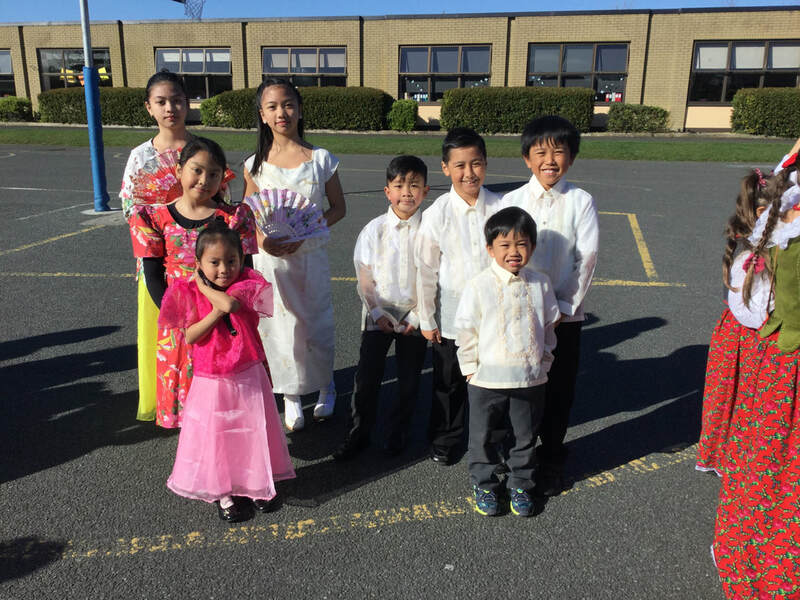 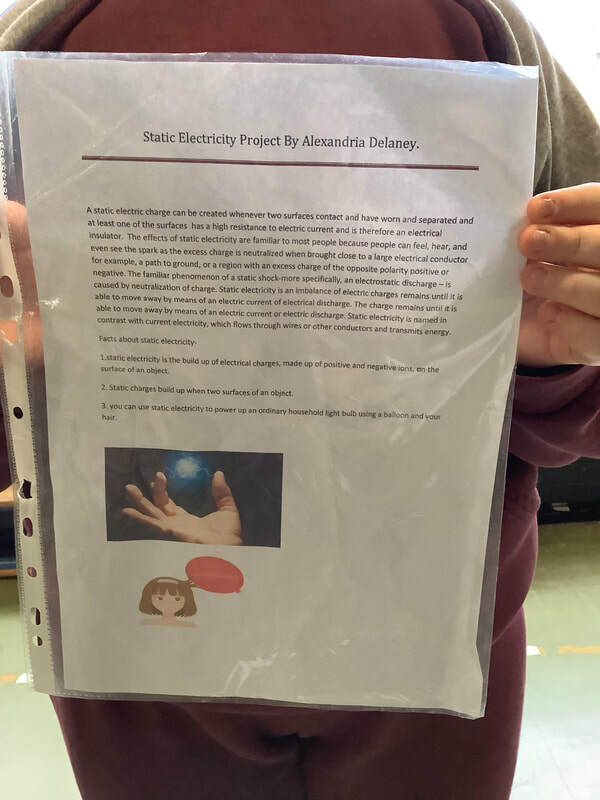 Ms. O'Grady's Second Class learned about China. 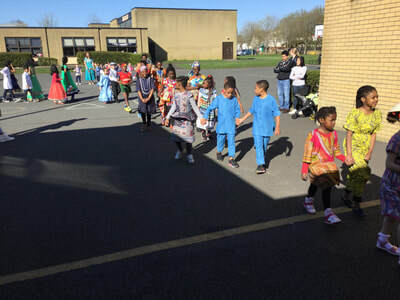 They sang Head, Shoulders, Knees and Toes in Chinese and made Chinese Willow patterns. 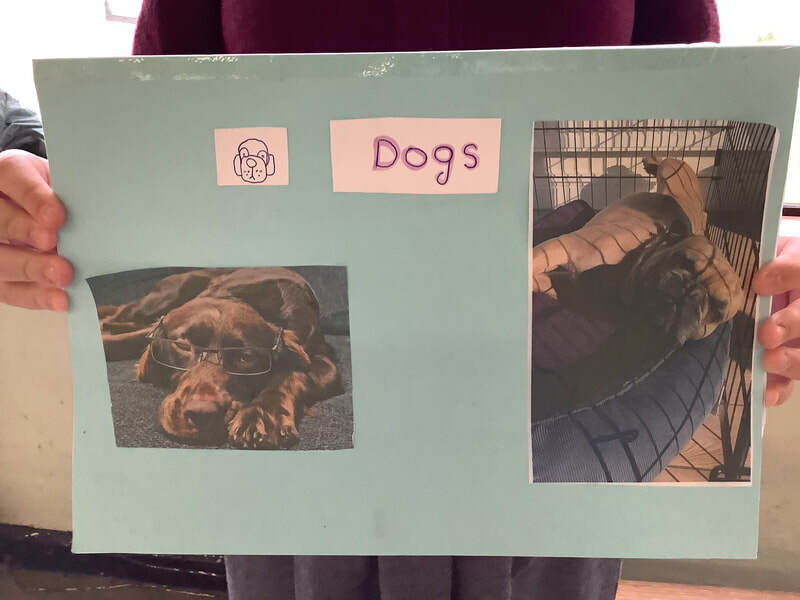 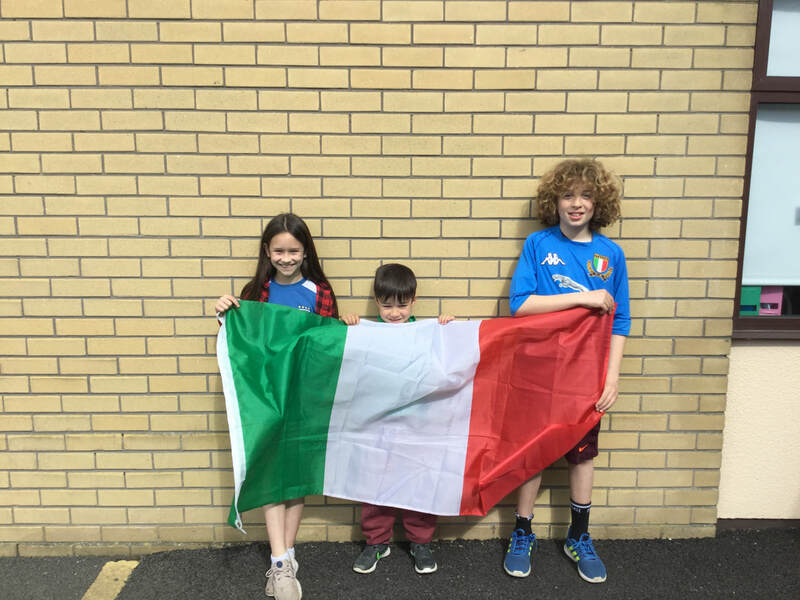 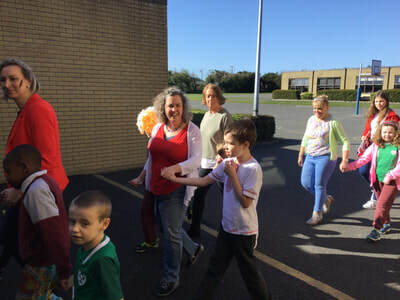 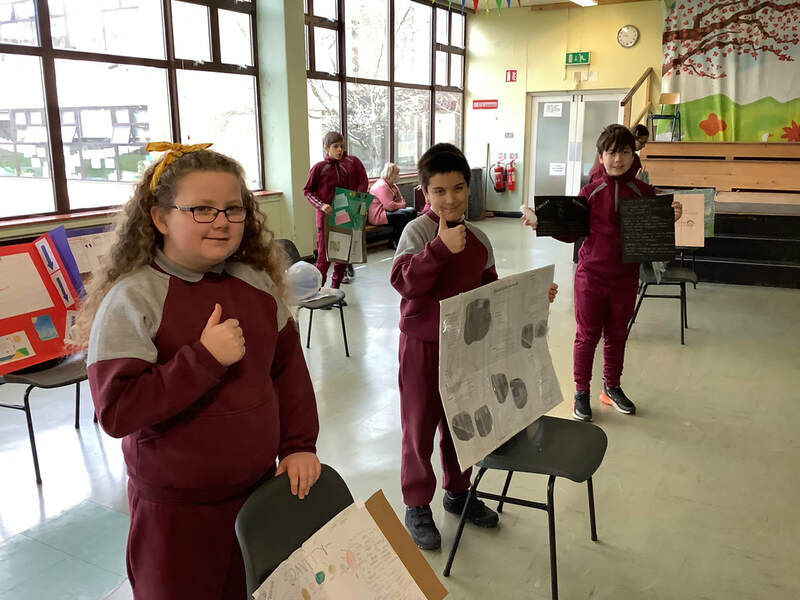 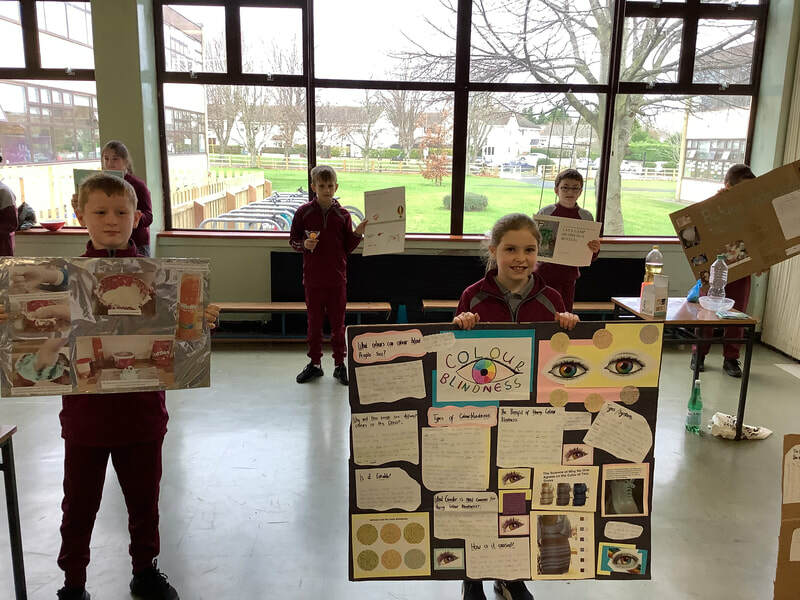 Ms. Gilsenan and Ms. Doyle's Second Class learned about Italy. They painted the Leaning Tower of Pisa, the famous Italian landmark, and sang" If you're Happy and you Know it Clap you're Hands" in Italian. Ms. Cleary's Third Class learned about Mexico. They sang "La Bamba" and they each painted a Sombrero, a traditional Mexican hat and a Cactus. 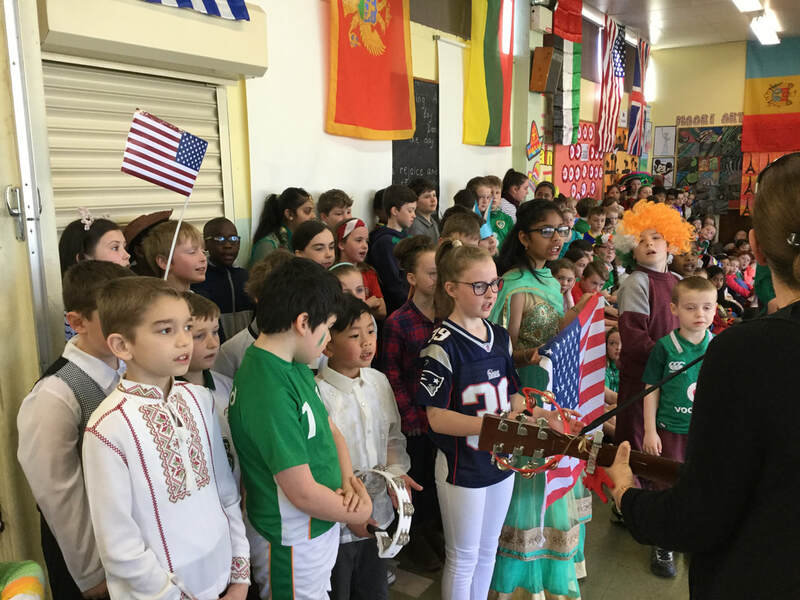 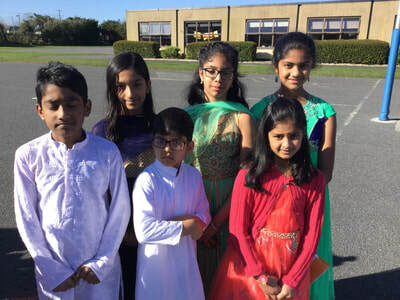 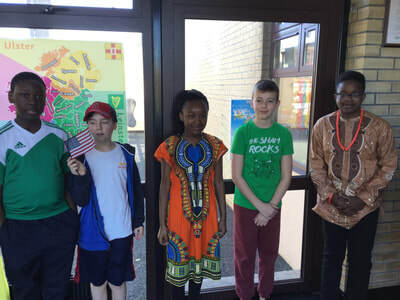 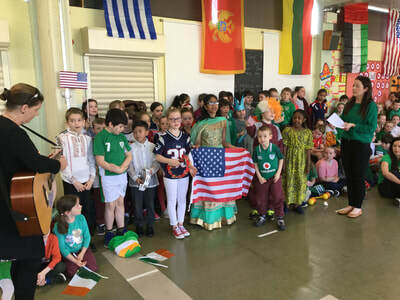 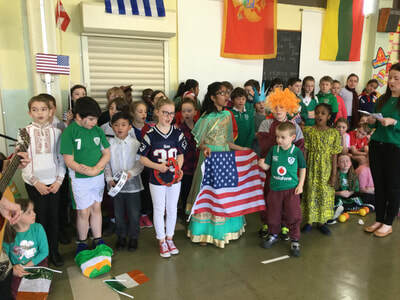 Ms. O'Donnell's Third Class learned about America. 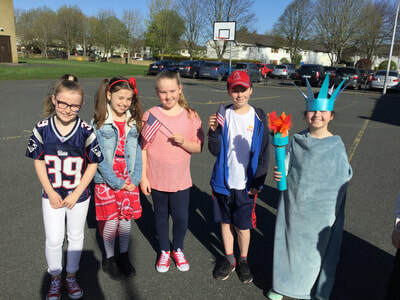 Each of the students painted a different American landmark and they performed "This Land is Your Land" by Bruce Springsteen. 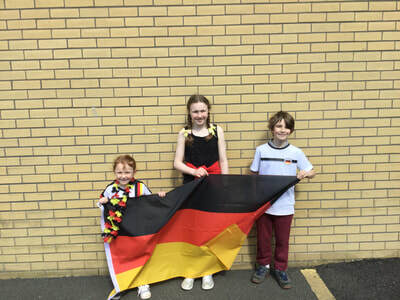 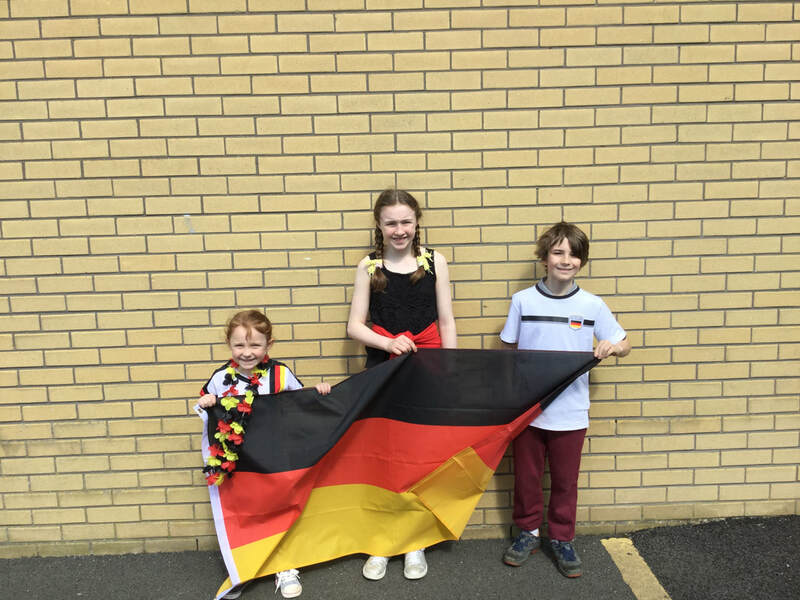 Mr. Byrne's Fourth Class learned about Germany. 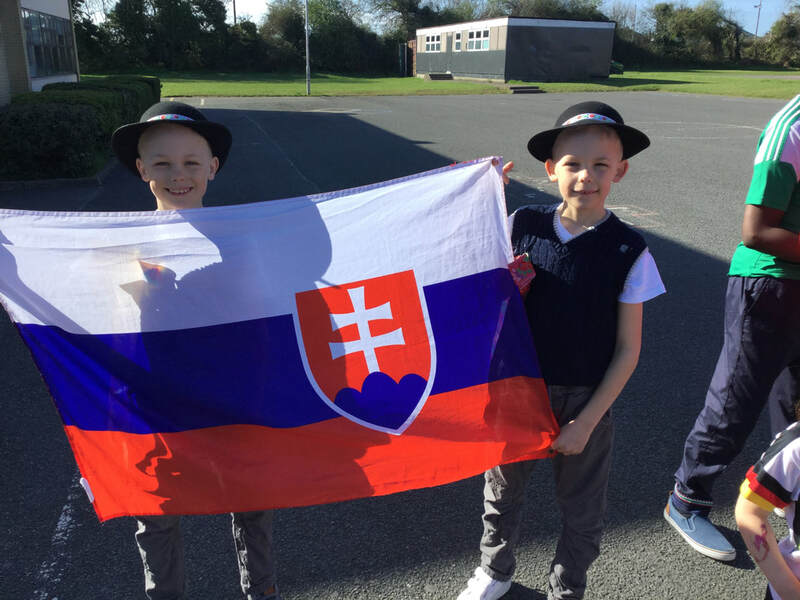 They drew the Neuschwanstein Castle, the famous 19th century castle in Bavaria, Germany. 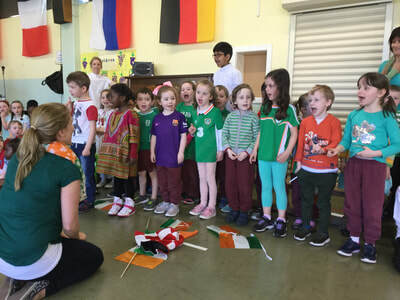 With the help of Ms. Kelly, they sang "Backe, Backe Kuchen". 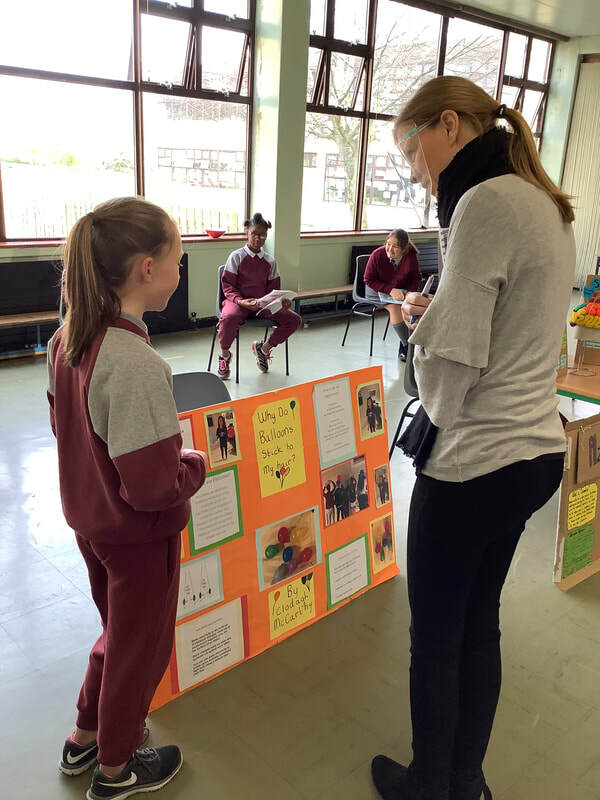 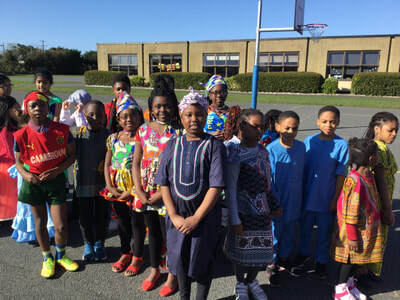 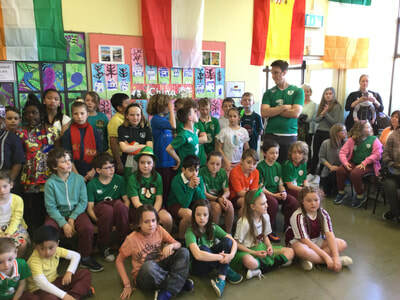 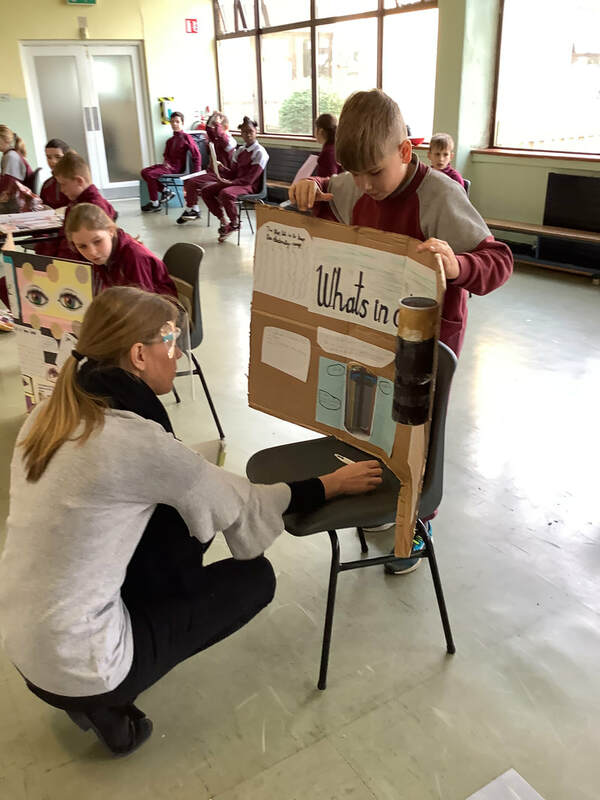 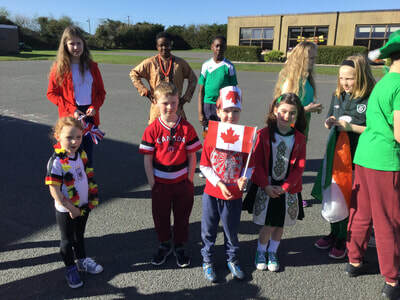 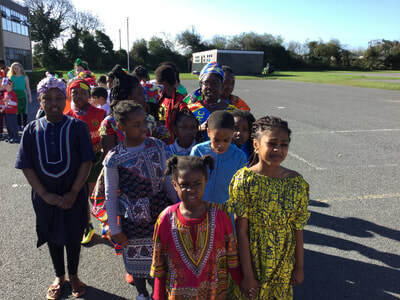 Ms. McCormack's Fifth Class learned about Tanzania. 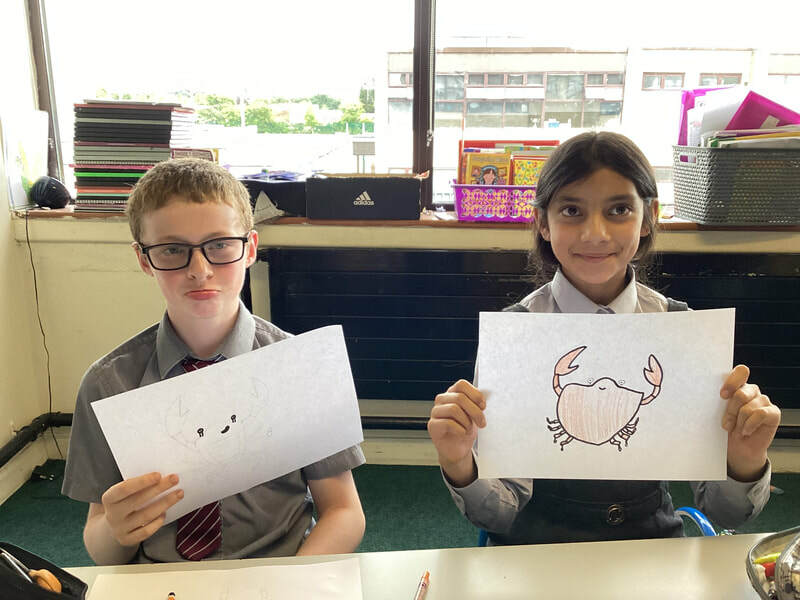 They each painted one of the Big 5 animals of the Serengeti African Plains - the inspiration for The Lion King. 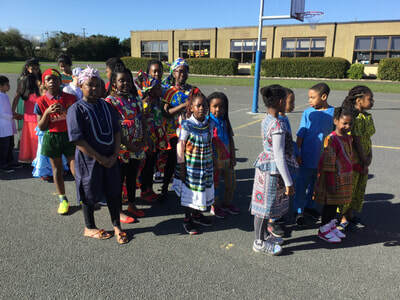 They performed "Jambo", a chant sung in Tanzania. 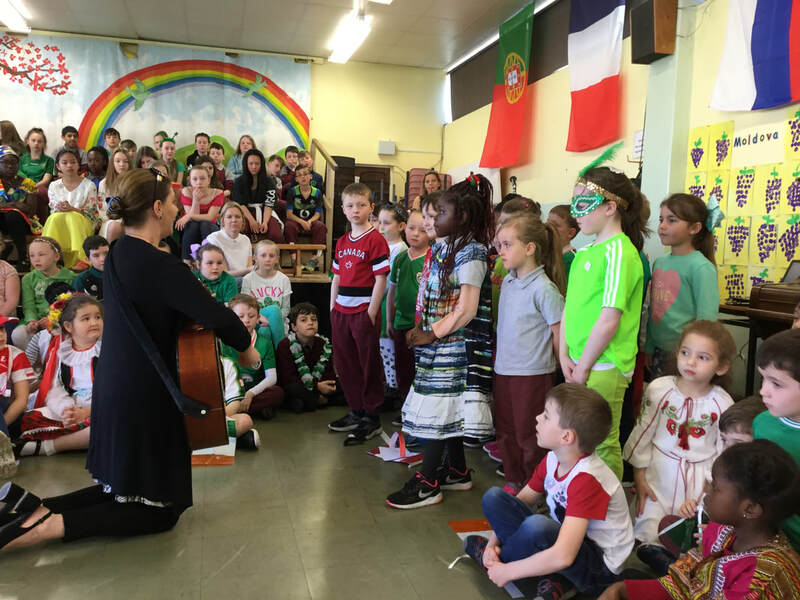 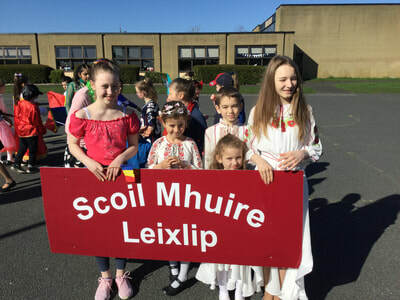 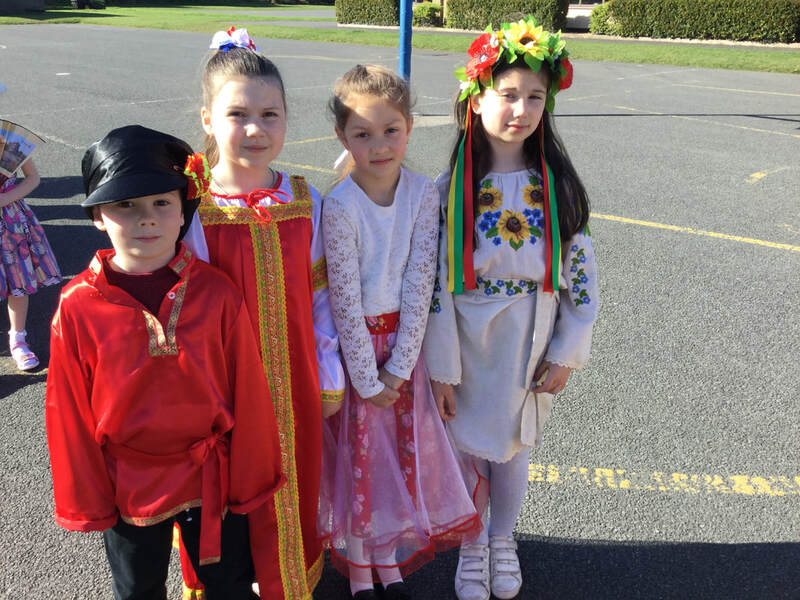 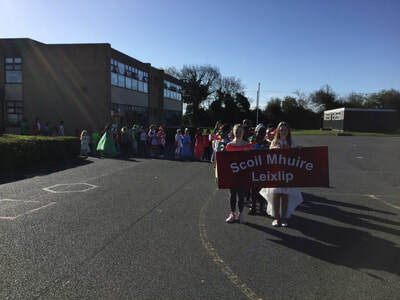 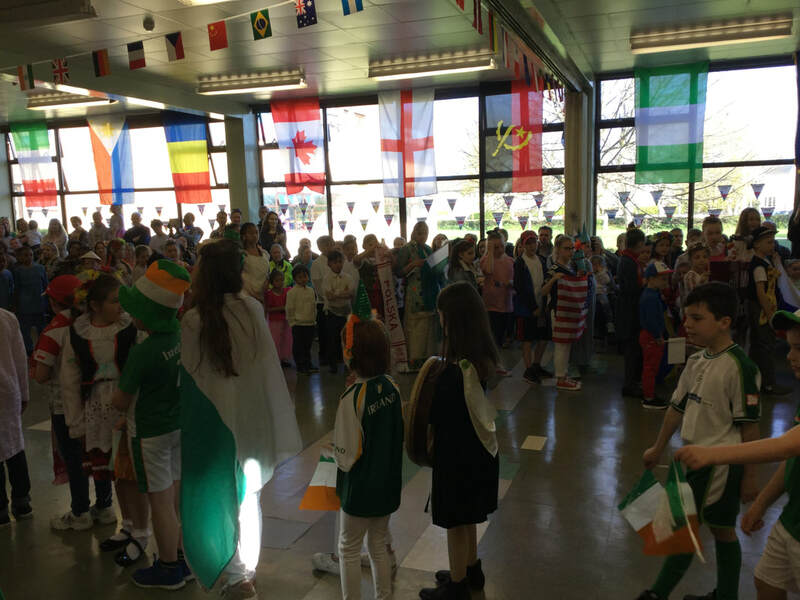 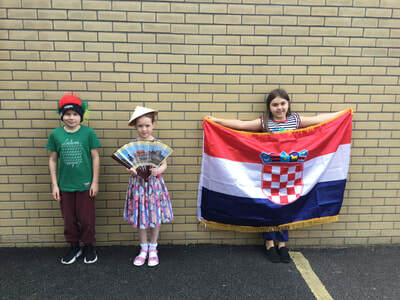 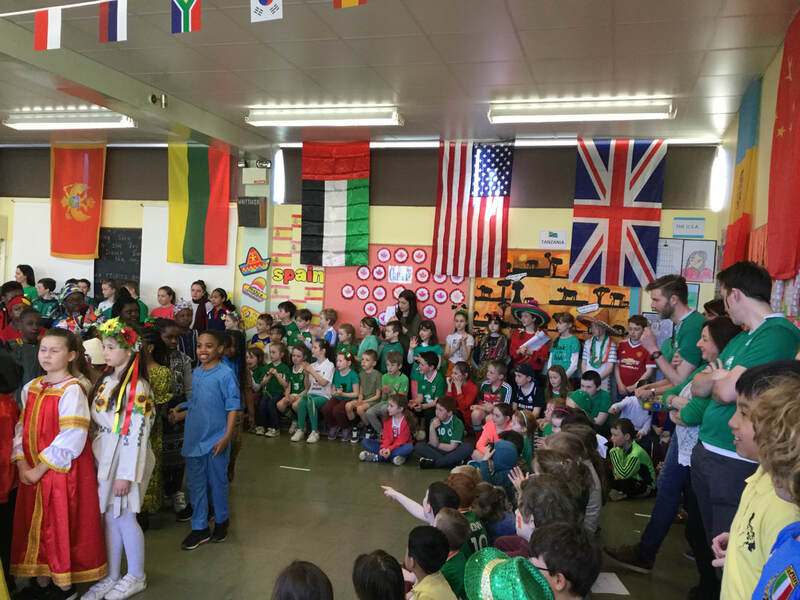 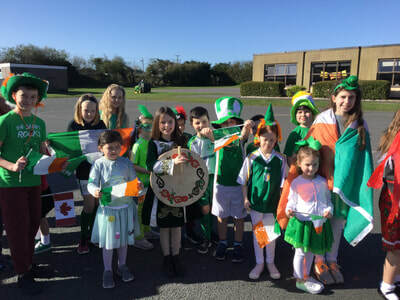 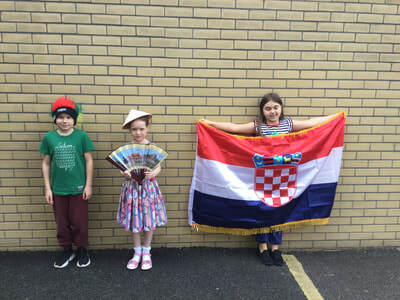 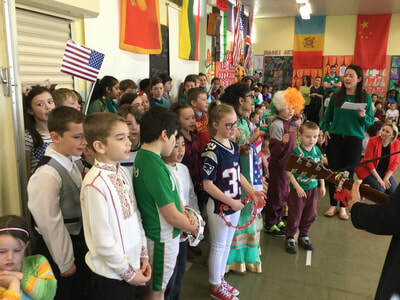 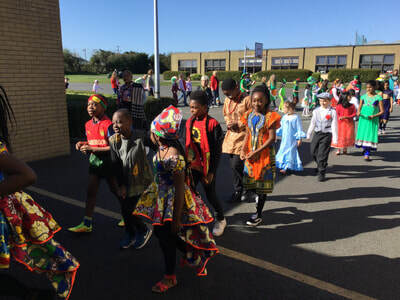 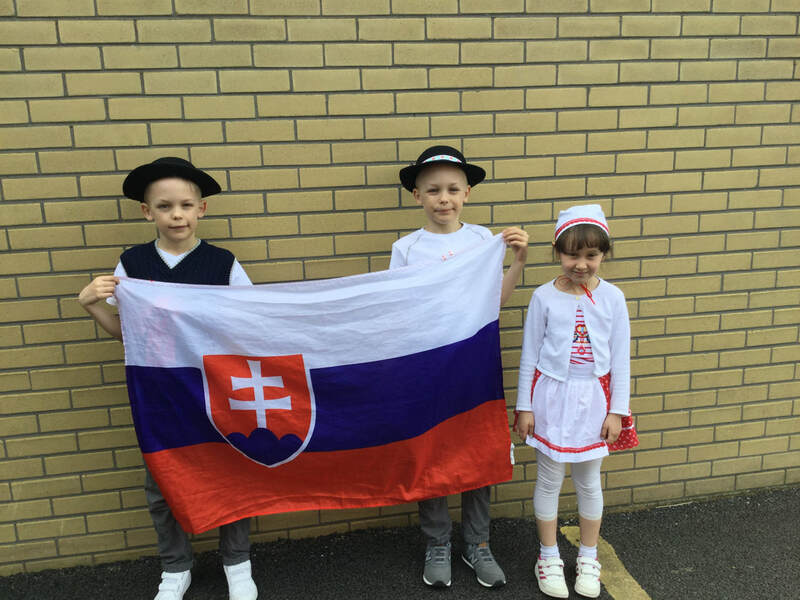 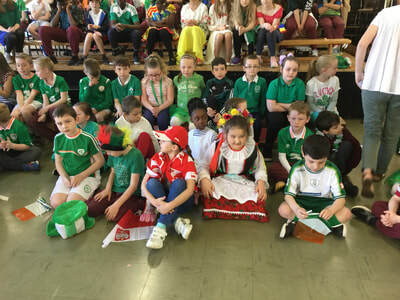 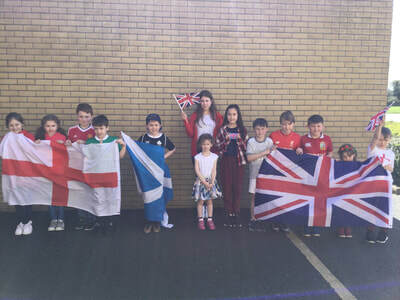 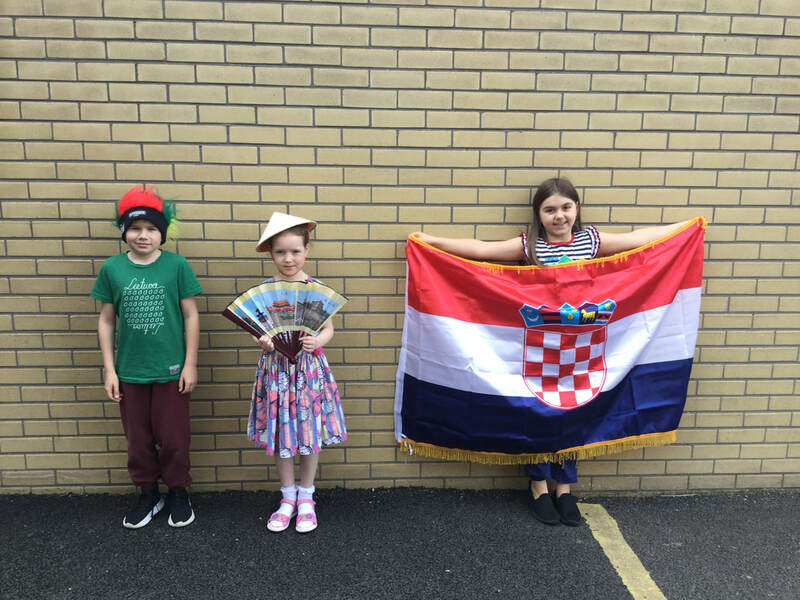 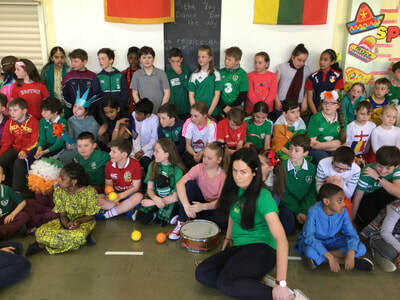 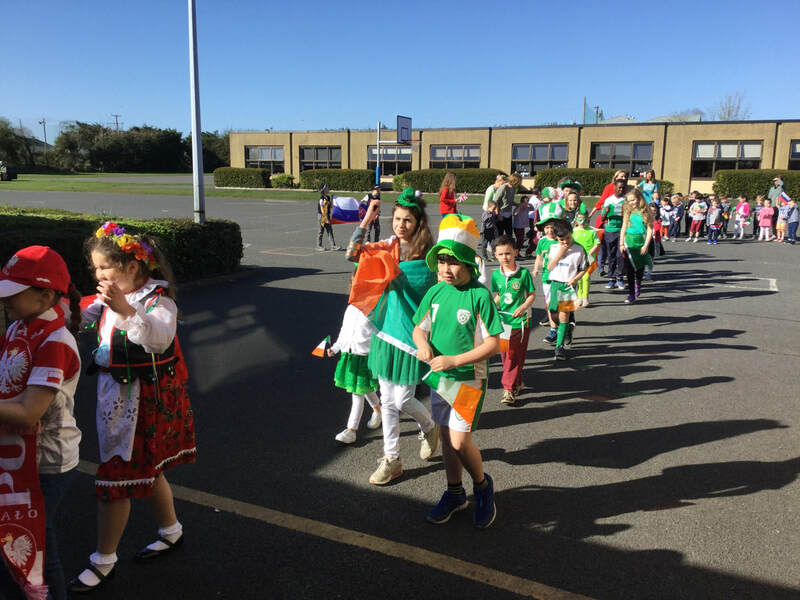 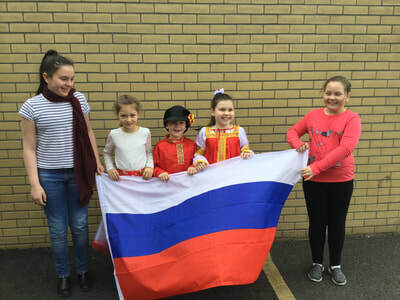 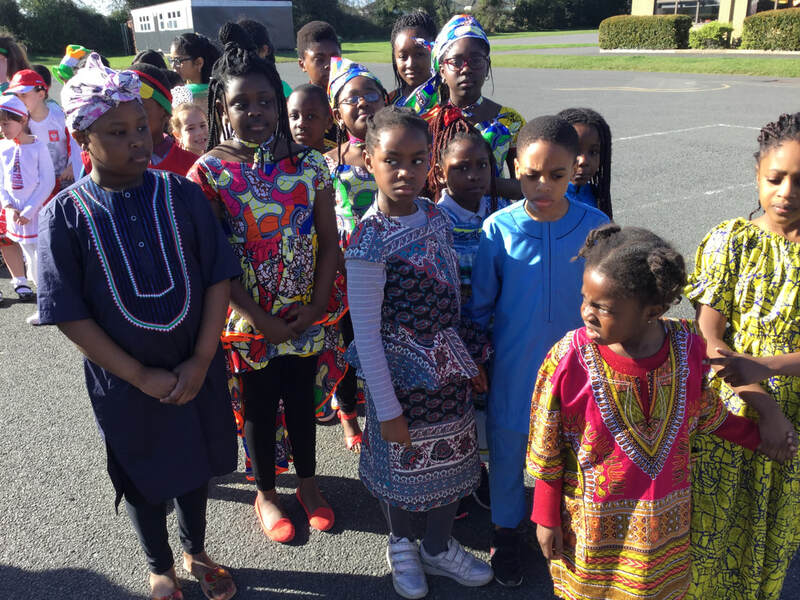 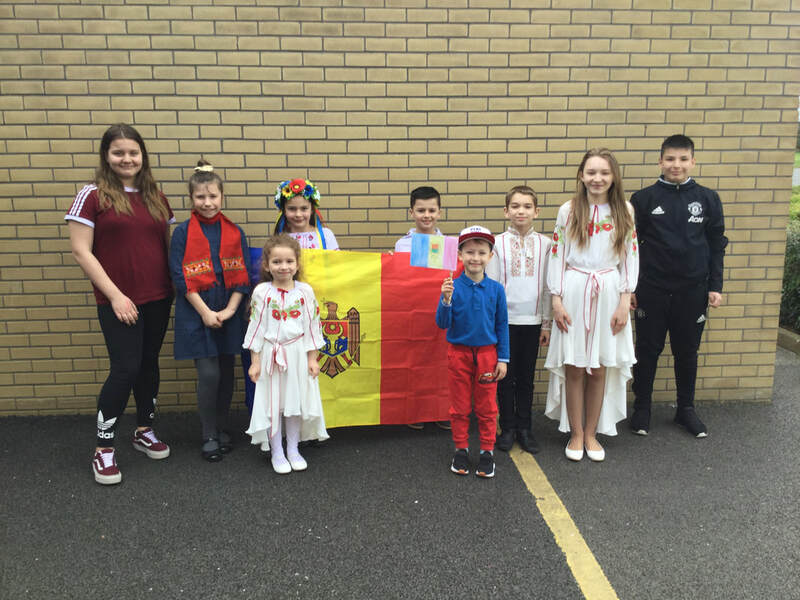 We were delighted to see so many students in their National costumes this year. 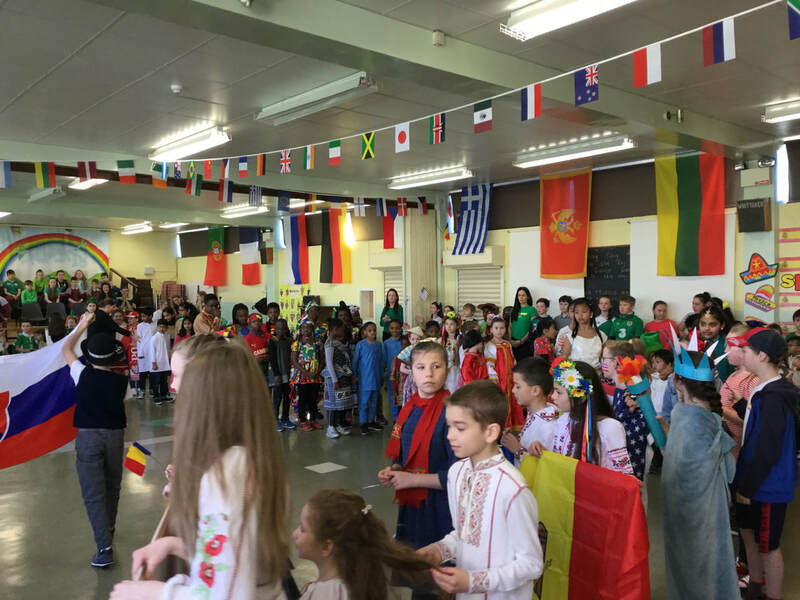 We have families from Spain, Italy, Poland, Germany, Romania, The Philippines, Nigeria, The Congo, Cameroon, Angola, Guinea, The United States, Ukraine, China, Pakistan, Romania, India, Slovakia, Russia, Canada, Lithuania, Latvia, England, Scotland, Croatia and France.